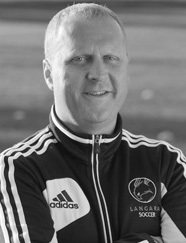 Ryan Birt has been the Langara College Women’s Soccer Coach since 2001. Under his leadership, the program has flourished, experiencing remarkable success in the past four years. In 2008-2009, the Langara College Falcons Women’s Soccer Team were victorious at both the BC Colleges’ Athletic Association (BCCAA) Provincial Championship and the Canadian Colleges’ Athletic Association (CCAA) National Championship. Under Ryan’s guidance, the Women’s Soccer Team has won three provincial championships and three national championships in the past four years. The team’s combined league and playoff record during this time is equally impressive – 57 wins, 7 losses and 7 ties. Off the field of play, Ryan has been acknowledged throughout his career by the coaches and administrators of the CCAA. In four consecutive years, he has been named the BCCAA Coach of the Year (2004-2007). In 2007, he was honoured by being selected as the CCAA National Coach of the Year. His Student-Athlete Accomplishments are commendable. They include 2 CCAA Players of the Year, 8 CCAA All-Canadians, 4 CCAA Athletes of the Month, 3 BCCAA Players of the Year and 36 BCCAA All-Stars. Not only has Ryan produced championship teams at Langara College, he has also encouraged them to understand the importance of pursuing excellence in the classroom and be exemplary citizens in the community. Academically, Ryan Birt holds a Master of Human Kinetics Degree from UBC and a National Coaching License from the NCCP. He has served as a Mentor Coach for CCAA which involves mentoring an aspiring female coach. Due to the spectacular success of the Langara College Women’s Soccer Team in the past four years, the City of Vancouver proclaimed February 3rd, 2009 as “Langara Women’s Soccer Day”.